My name is Sheila Trenholm. I developed Ulcerative Colitis (UC) when I was 14. It has been a lifelong struggle which was nearly insurmountable, until February 1, 2001 at the age of 33, I started SCD. I had gone through a very bad flare-up of my UC in September of the previous year. I was hospitalized for about a week in September about 40 lbs underweight and put on prednisone (a steroid). Shortly after weaning off the prednisone, the colitis flared again and by the end of November I was back in the hospital. About 9 days later I was sent home again with another round of prednisone. At the end of January, although still on prednisone, symptoms started coming back even quicker than before. The doctors had told me they had no idea what was going on. Some of the emergency room doctors said that most people who had UC for a long time, usually ended up having to have surgery. This really scared me. My husband felt that we needed to take matters in our own hands and said let's check the Internet and see if we can get some ideas about what causes Ulcerative colitis and mechanisms for fighting it. The first link that popped up was about SCD ™. He said let's check further and see if there is more information. We ended up on the Amazon site with the reader's reviews of Elaine's book, "Breaking the Vicious Cycle". The reviews were very encouraging because they were from people who had gone through the same things and were seeing great results. We agreed that I would start the diet the next morning. I gave up my usual bowl of bran flakes, homemade bread and milk and sugar - laced tea. I think I ate a plate of eggs. By lunchtime the cramps and pain in my gut disappeared. I was completely flabbergasted. Teams of doctors and increasingly higher doses of prednisone had only been able to help in the past and only after days of IV treatments. This had worked within hours. I called my husband at work and told him he had to find this book before he came home that night. About a year later (and doing amazingly well) my husband and I sat down and talked about putting our kids on the diet. They had been having the same SCD ™ lunches and suppers as me but were still having cereal for breakfast. Our son had been put on IV antibiotics right after he was born and had always had frequent, very smelly, mushy stools. Although frequent, soft stools are pretty normal for a baby, they didn’t improve as he got older. We started him on SCD ™ when he was about 2 1/2 yrs old. Within days of starting the diet awful smell of his stools went away and the frequency dropped from 5-8 a day to 1-3/day. He now has formed bowel movements and is doing great. Even my husband and daughter had surprising results when they went on SCD ™ 100%. My husband lost the 50 lbs that he had fought with over the years and my daughters’ occasional but intense constipation was also brought under control. After a few years on the diet I developed a very bad, yeast overgrowth. The yeast overgrowth was the result of antibiotics. Along with SCD ™, I used some legal supplements (yeast killing enzymes) along with natural anti-fungals to combat the fungal overgrowth. There is more information on these supplements and the approach that I took at http://pecanbread.com/new/yeastsheila.html Things were slowly improving until I was treated with antibiotics twice unnecessarily (the first round was for a misdiagnosis of pneumonia) and the yeast flared up again along with a flare up of colitis - for which I was hospitalized in the Spring of 2006. In the hospital, I was taken off all drugs including the medication I had been taking for UC; which I had been strongly encouraged to continue while on SCD by my GI specialist. There was some improvement after stopping all the medications, including the UC meds. After getting out of the hospital I decided to try Saccharomyces boulardii; a good, probiotic yeast. After a few of weeks of taking the S. boulardii I was able to tolerate yogurt again along with a greater variety of SCD foods. I stopped using the anti-fungals, but continued the enzyme for a few months – using it before/with meals to help digest foods. I still take S. boulardii and occasionally L. acidophilus probiotics, but don’t take meds for UC any longer. I have been in continuous remission since the fall of 2006. Besides UC, SCD ™ has helped me in other ways. After many years of not being able to get pregnant I was eventually diagnosed with Poly Cystic Ovarian Disease (PCOD). This is a condition, which causes irregular periods and can lead to infertility. With the help of fertility drugs I was very fortunate to be able to conceive and have two beautiful children. After the pregnancies my body returned to having very infrequent periods. While in the hospital for the flare (that brought me to SCD ™), one test discovered that I also had moderate Cervical Dysplasia. After a year or so on SCD ™ I stopped taking birth control pills, which were supposed to help regulate PCOD (but didn't). I had my B vitamin levels checked and found that my malabsorption had been corrected while on the SCD ™ and I was able to stop taking multivitamins and the B complex supplement. Soon after this, the PCOD came under control and the dysplasia "disappeared"- much to the surprise of the specialist and her nurse (both wrote down the title of, “Breaking the Vicious Cycle” and asked for an explanation of the diet). More wonderful side effects of SCD ™, the chronic acne I had since a teenager has improved, as well as the cystic acne, mild eczema and rosacea. I originally joined the children’s SCD ™ list (now known as Pecanbread) to get some ideas for school lunches and to be able to discuss having children that were doing the diet. I have a degree in Biology and worked at the local university in a Food Science lab where I helped develop new food products, run microbiological tests and test food products. I am now a SCD ™ counselor, SCD ™ Consultant and I am a moderator of the SCD ™ discussion group, ‘Pecanbread’. I can be contacted at sheilat@nl.rogers.com . The website for children and SCD ™ is http://pecanbread.com/. Pecanbread is a Yahoo discussion group for those implementing the Specific Carbohydrate Diet ™. Many, but not all of the members, have children with ASD (Autism Spectrum Disorders). Anyone following the SCD ™ is welcome to join our group. Information for joining the Pecanbread discussion group can be found at http://pecanbread.com/new/local1.html. 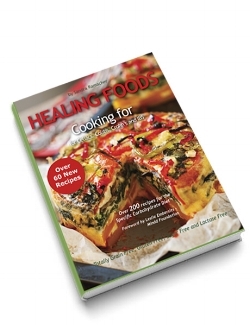 I met Susie for the first time in person at the launch of my Cookbook ?Healing Foods? at the Gluten Free Food Show in Sydney in November 2007. She arrived with an entourage of supportive girl friends, who all were amazed at the progress Susie had made in healing her disease. At her worst Susie weighed 42 kg, which is mighty slim for a 163 cm tall young woman. So when she gained 1.5 kg it made a big difference. Susie's U.C. is going into remission, “I?m not fully there yet, but my symptoms are so much better than what they every were. I can sleep at night, I can go to work and even go on weekends away with my boyfriend”. “For the ?rst time in years I went onto my boyfriends boat for the day, and I could not have done that before”. I had Crohn's for about 8 years before I started SCD. I had always been looking for the right diet because I believed that a gastrointestinal disease could only get better with food but it took me a long time to find SCD. When I started SCD I was extremely thin and so weak that I could barely walk across the room. I had urgent, bloody and/or mucus filled diarrhea close to 30 times a day. I can't tell you how many times I blacked out just trying to make it to the bathroom. I was dealing with intense waves of pain that would last anywhere from 15 minutes to an hour. I really thought I was going to die. I heard about SCD and decided to try it for a month. I kept a detailed journal detailing my meds, foods, bowel movements and overall feelings each day. This was such a great tool because seeing my progress motivated me so much. After the first few days on SCD my stomach wasn't bloating after eating...this was amazing because it used to bloat so much that if I was wearing a belt I would have to loosen it 3 belt holes to fit. My bowel movements also decreased to about 4 a day which was absolutely remarkable. After the first week or so I tried walking down our driveway. I made it! I had to sleep for about 2 hours afterwards but I hadn't walked that far in months! I read Elaine's book everyday. I focused a lot on the testimonials and I remember one that I read over and over about a little boy. The mom was so amazed that after 6 months on SCD her son was running and playing with other kids. I thought, that is incredible but it is it really possible? 6 months later we were celebrating Christmas at my aunt's cottage. Everyone was outside on the frozen lake skating and playing hockey...including me. As I raced after the hockey puck I realized that I had done it! I was just like that little boy, running and playing after only 6 months. That was such a powerful moment in my my life and I will never forget it. I have been symptom free for almost 4 years now. I have a healthy two year old and another baby due in the next month. Life is great and I am so grateful to Elaine. I wanted to thank you for your wonderful recipe book. Our children have enjoyed all of the recipes I have cooked so far. The amazing thing is even our 11month old son has been able to handle the food as well. He is the main one at the moment we're doing scd for. He has had trouble from birth and eating for both of us had become a nightmare. Now we both can have the soft bread, apple and pear sauce and pancakes so far. It has been wonderful. He hasn't had any pains or bleeding. His motions have been normal. This has been over a couple of weeks now. Thank you for showing us the way. Our family is so enjoying your recipes and lovely colors of your book. Our daughter with Crohns has been on SCD for 13 months now. She isn’t 100%, but she is the best she has been in four years. Our family lived in Melbourne for 4-short months…….it was heaven and your recipes are too. P.S. Our son, 13 has Celiac, he won’t do SCD, but he does love your food……and desserts! P.P.S. I’ll be buying a book to take to Johns Hopkins……yummy for them! Just a wee note of thanks. I downloaded your "Sensational Thanksgiving Menu" and made the whole whizz-bang for our first SCD Christmas Dinner. Usually I make all the usual family favourites and end up eating very boringly myself as there's no energy or funds left for something special for me. This was my 3rd SCD christmas so I decided the family would just have to have something I wanted for a change! I really enjoyed it and have managed to add a few more foods to my SCD repertoire that I hadn't introduced at that stage. I intended eating it and just facing the consequences , however I didn't react to anything! Yay! My new fave is the Lima Bean Mash - Yummy!!! Thanks again and I hope you had a great christmas and new year. I have been practising as a naturopath for about 17 years and about 8 years ago, a client presented to me with Crohn's disease. The client was very ill and had told me that if his condition did not improve he no longer considered life worthwhile. My previous work with clients with ulcerative and Crohn's disease had convinced me that immune function had a key role in the disease and for treatment. I tried many treatment options with this client - including herbal medicine, diet, homeopathy and nutritional supplementation. Although there was some success, nothing gave longer term lasting results. It is a terrible feeling as a health professional when you can't help a client with their health problems. I did some further research using the internet to give me some ideas on new treatment avenues. I found nothing of any noteworthiness, except information on one diet - the Specific Carbohydrate Diet (SCD). Initially, I was sceptical of this diet as its basis of treatment largely differed from my training and research of the last 9 years. Basically, I understand the diet to "break the vicious cycle" of immune response causing disease - by excluding certain foods especially complex carbohydrates that are not well digested. At the time, I didn't believe the diet would help my client at all, but the author of the diet, Elaine Gottschall, was convinced of its ability and she wasn't selling anything! So, I told my client about the diet and asked him to use it to the best of his ability. I was giving him some hope. Over the next few weeks my client improved. There was a marked reduction in pain, reduced episodes of diarrhoea and the absence of blood in his stool. He slowly removed the drugs he was prescribed and with 3 months was free from any drug treatment. Today, this man is enjoying his life, only using the Specifc Carbohydrate Diet and some supplements. I was so impressed with the results that I decided to try the diet myself to treat respiratory allergies. I have found it to be very effective on this front. Since my first case some 8 years ago I have used the diet on many clients with GIT disorders. I also decided to use the diet with many other conditions, including diabetes mellitus, auto immune disorders, weight loss and many other conditions. I now employ this diet for all clients and in most cases I find it highly effective in treating and maintaining the health of my clients. I just made the ABC (Apple Blueberry Crumble) it was scrumptious! Even my very picky ASD teen said he loved it the first time he tried it. Thank you for the beautiful recipe with such a low honey content. We all have yeast so the less honey the better. I will say that I messed up the crumble by overprocessing it. I changed my recipe to read GENTLY PULSE the crumble. Also, next time I will try adding some cinnamon as well. I was just given your book Cooking for Celiacs, Colitis, Crohn's and IBS for my birthday and I had to write and tell you THANK YOU!!! I have been on the diet off and on with my kids for some years now but a book like this has renewed my inspiration and given me hope. Also you referenced a place to maybe get dry curd cottage cheese and I have not as yet been able to source that. (I am in Australia but not in a major city). The photos are beautiful and my 8 year old son who is very upset that he can not be 'like everyone else' feels much better about his food when he looks at your beautiful photos and anticipates me cooking the recipes. As a side note, I just received your book this afternoon. I can't wait to try the recipes. My son, 16, was diagnosed with crohns 4 years ago. I heard of the SCD diet at the time of his diagnosis but thought it was too rigid to force him to follow. He did well for 3 years taking only Asacol after an initial 3 month treatment of prednisone, eating whatever he wanted with no symptoms. However after two years his lab tests showed obvious disease activity to a moderate degree. After much prodding from his doctor we finally relented and put him on an immune modulator called 6mp last December and it has been a nightmare ever since! Long story short he has been hospitalized twice in the last 5 months, undergone 4 CT scans, 4 MRIs, been healed of an abdominal abcess as well as two fluid leaks outside his intestines, lived with an IV catheter in his chest for 1 month and only able to drink a liquid diet for 90 days. Against his doctors wishes we stopped the 6mp because we believe all the events that have transpired were a result of the medication and his body's inability to handle it. We refuse to proceed to the next stronger medication until we give this diet a try. Of course the doctor had never heard of the diet and refuses to believe that diet plays a part in the disease nor thinks diet will help him improve. The fact that he went into remission on a liquid diet and a month into eating the SCD way is still in remission leads me to believe he will do just fine, since he was never able to achieve clinical remission before even when using steroids and immune modulators. Thank you for the recipes you have put together. We are implementing the SCD diet very slowly so as not to cause a relapse, only adding new foods every two days, so it will be quite some time before we can try most of the recipes in the book, however it gives us something to look forward to as the food all looks so delicious! The timing receiving the book could not have been better, as a lady I work with was just diagnosed with Crohns this week so I can recommend this wonderful book to help start her on the right path from day one! My name is Monika and I am a mom of a 10 year old with Crohn's disease. Christopher my son was diagnosed 2 years ago and as you can imagine it has been quite a battle. We have tried so many different medications and were in hospital for a week last year. After the stages of denial and anger and sadness we have finally reached acceptance and began the SCD a month ago. The reason for my email is to not only thank you for your awsome cookbook but to ask you how long it took you to be symptom free. He is no longer cramping or has gas but I still see some blood in the stool. He has made peace with being on the diet and I am trying new things every day to keep things exciting and tasty. Your great recipes and wonderful picture have help me so very much. We hope to hear from you soon. I've just recently purchased your beautiful cookbook along with Elaine Gottschall's 'Breaking the Vicious Cycle'. My daughter was diagnosed with Crohn's Disease last summer when she was 16 months old. 8 months later and her doctors are proposing surgery as she's not responding to her medication. She will be two years old at the end of March. I was wondering if the Special Carbohydrate Diet is suitable for such a yound child and also is it absolutely necessary to give up fluid milk? My daughter adores her bottles - won't go to bed without one - and as a result (along with the obvious calcium benefits) I am very reluctant to take her off milk. I switched her to goat's milk about 4 weeks ago. Thank you for your very prompt reply. I will follow up on your suggestions. I have only been dabbling with the diet so far (while trying to source an electric yogurt maker in Ireland)! The time has come to just get stuck in. My little one has been much better this week and I like to think it is down to the restriction to some degree of the complex carbs. little coccoon just by changing his diet!! Thank you! I am so excited to have received your cookbook in the mail today! I am somewhat of a cookbook junkie and this one is great, my favorite SCD cookbook so far, it is beautiful. I have BTVC by EG and Eat Well, Feel Well by Kendall Conrad. I myself do not have any diagnosed intestinal problems but I do have a son with Autism and have been poking around with doing SCD for about 2 years now. Regardless of intestinal disorders, I believe this is such a healthy way to eat! I do a lot of SCD style cooking already but I want to fully transition to be legally compliant for the New Year, I think our whole family can benefit! I have 4 children ages 8, 6, 3, & 2 and 1 husband (ha!ha!). Our son has Crohn's and has been on SCD for 14 years. The diet has saved his life. We corresponded with Elaine G. for many years. Saw your new cookbook in the library and it is wonderful. We are going to buy a copy today. Also mentioned your book on our listserve, "Healing Crow" at yahoo. Not certain if our son will tolerate the almond flour.....years ago it bothered him, but we will try it again. But your souffle bread has been a big hit.....we had to buy a toaster over so he could toast it. Thank you for your book and your ideas. I've had Crohn's for 7 years. It started out as proctitis, I mostly had small amounts of B, which later progressed to alternating normal stools and D. I later showed tiny ulcers in the terminal ileum, as well as a few small stomach ulcers and mild acid reflux that were cured by Prilosec and avoiding overly acidic foods. I started changing my diet immediately by cutting out a lot of processed foods after I was diagnosed, but nothing has worked as well as SCD has for the last 2 1/2 years. I have a history of a lot of antibiotic use and was under a lot of work-related stress when diagnosed. There is probably also a genetic component, since my grandfather had colon cancer that was luckily cured by surgery. He lived until he was 86. Doing the diet has been a lot of trial and error in finding out what I can and can't tolerate. I can't tolerate dairy, so I've cut it out, and am trying to get my calcium sources from elsewhere, since I have mild ostopenia. I can only tolerate small doses of calcium supplements, since they tend to give me B and C. I have to be really careful of acidic foods, but that seems to keep the stomach issues at bay. In the last year, I have used a teaspoon of food-grade A15 methylcellulose as a fiber supplement off and on, even though illegal, but if I can tolerate more beans, I may be able to stop using it. I've had no ill effects from it. In fact, it's been beneficial. I also use Miralax when I need it. In addition to SCD, I am now practicing mindfulness meditation 30 minutes a day, which helps tremendously with my gut issues. It raises your serotonin levels, much like LDN, I suspect. I've also found yoga helpful. I walk around 9 miles a week. I just completed a 100-mile challenge on DailyBurn.com (It took me a couple of months) and am 18 miles into a NY to California walking challenge. This keeps me motivated to exercise, even if it takes 2 years :>). My GI is pretty tolerant of my alternative medicine approaches. I just hope this diet goes mainstream someday to help all the people out there who could benefit by having a doctor prescribe it. I want to thank you for making the effort to heal yourself from colitis, and gifting some of us “out there” with a terrific and inspirational cookbook – thus helping us in our attempt to conquer this agonizing inflammation. It takes a lot to go through what you have been through – and succeed! My hat off for you! I am a Mom of four young people from 17-22 years, and have been married to Thomas since 1987. I was born in 1964, like you – and actually just had my diagnose less than a year ago. I have had two flares of about one month each, followed by stomach aches (cramps) and nausea for months. I am taking 3 x Asacol 800 mg a day, but have only done so for a couple of months, and have no clue as to whether they “work” – exactly on the same day I began medication, my diarrhea was gone hours before and has not returned!! (So I don’t think I can blame it on the pills - I was already on an exclusion diet from early January). My “luck” is that I have access to many resources, one being the will power not to accept that there is NO CURE for UC – I will never, ever believe that from any GI. In my attempt to find my own way through this, I actually came across Elaine’s book at the local library about a year ago, and I borrowed the book (which btw has been translated into Danish by a “sister” with UC), only to leave it on my bed stand, unread – at the time I was too agonized to go through with any diet. I was also in denial about the diagnose, for sure – scared that I would die, while camping out in the loo! Few months after my first flare, I found a guy who has a physiotherapy clinic only 800 meters from my house. This guy, David, healed himself from Chron’s through an exclusion diet. He was on the verge of colon surgery 10 years ago at the age of 28, with the prospect of living the rest of his life with a stoma. And he did not want to do that. Thus, he finally received relevant treatment and dietary advice from the Hospital at Cambridge University, paying himself to go to England several times for health checkups and to plan his diet. Over this past year I have received diet advice from him, and it has helped me a lot. I have for instance stayed off pork and beef, milk products, wheat, sugar, artificial additives, and shell fish for a long period of time. I am sure going down this track has prevented me from getting worse. Still, I found out, that this type of ailment is so individual, and I realized that I have problems digesting some of the foods, that David advised me to eat - like potatoes, rice and (spelt)bread as a whole – so in my quest to heal my colon, I have come back to Elaine Gottschall and her book. And this time I HAVE READ THE BOOK ;) I immediately put two and two together, and figured that what I read all made sense – I have a hard time digesting these foods, and there is a reason why! My curious and very helpful hubby immediately started the yogurt production to provide me with probiotics – and I began cooking according to Elaine´s book. The internet is a fantastic resource – recently I started looking for forums with people who suffer from different IBS related symptoms – what a relief to find that so many benefit from the SCD diet, and how sad to read of how orthodox medicine across the world, and as a whole, only offers heavy drugs only to treat the symptoms! I have a GI appointment coming up end April at a different hospital from where I was diagnosed. Luckily we can freely choose between hospitals in Denmark, and I hope to have found a less arrogant treatment environment with this change. We´ll see. I love to cook – and I must admit that I do not find the recipes in Elaine´s book too inspirational – so I started looking for other SCD cookbooks, and quickly found your fantastic cook book Healing Foods on www.digestivewellness.com – they shipped the book within days, and I received it safe and sound here in Denmark a week ago. I was excited when I opened it and saw all the delicious photos! I have almost read all recipes by now, and I see “the picture” as to how to combine and make the most of the allowed foods on the SCD diet! I have baked a few of the cakes by now, but mostly important, I have now learned to produce dripped yogurt, French cream, cheese and Labna, which will make my salads etc. so much more delicious! You go about this knowledge so rationally and it is so easy to follow your instructions – and great to be advised to stock up different homemade foods to add to the recipes! Variety is so important, when you have to exclude different foods, and the taste of course. I am excited to get acquainted with your recipes and mix them with my own. And I am pleased to know that my whole family (and their colons) will benefit from these new eating habits. I have trouble finding the almond flour. Well, if I am willing to pay tons of money for a bag of 2 kilos, I can order online in Denmark, and have it sent by mail (and pay the shipping costs on top) – the Danes still have a long way to go here. I have found out that some of the best organic almond flour can be bought in 10 kilo bags in France – and I will pursue to find out how to get this. For now I make my own flour, but I am sure, that I do not grind it enough for some of the pastry recipes. But I will get around to that. I am taking a vacation in Berlin next month and will check out the organic stores there. Your references in the book of where to get almond flour in Europe are a little scarce. The British sites do not ship to the rest of Europe, I found out to my disappointment. I will let you know, if I succeed finding a dealer in Germany, which ships to the rest of Europe. I have a lot of great appliances in my kitchen, except a food processor – for now I get by with a nice big blender and my Kitchen Aid food mixer with shedding appliances. I also have a mandolin to make the zucchini spaghetti on as well as all kinds of different cuttings. I have been on the SCD diet for only two weeks now, and my stomach cramps/nausea are slowly decreasing – at least the duration. I don’t have the same severe pains after food lands in my stomach as before. I will allow myself to feel relieved, though I still have a long way to go. Please pad yourself on the shoulder from me – for making yourself well – and for helping me to get well, too. A good health is priceless, and I am sure you have worked hard, not only to find back to your own good health, but also in pursuing to write and gather the recipes, take pictures, find finances and finally publish and distribute your book! I hope it is ok if I write to you ever once in a while – with questions to your recipes, for mutual encouragement, and sharing my experiences with you, both from the kitchen regions and letting you in on how cooking SCD foods will help me regain my health.